JSSC Sub Inspector SI Results 2017 – Apply Online for Jharkhand Daroga Online Exam Result out: Jharkhand Police SI Results declared. The Jharkhand Staff Selection Commission (JSSC) has announced Online exam result of Sub Inspector (SI). Online applications were invited for Jharkhand Daroga Examination for filling up 3019 Sub Inspector vacancies. JSSC Sub inspector SI 2017 Result out. The Jharkhand Staff Selection Commission (JSSC) is going to conduct online examination for the first time for the post of Sub-Inspector (SI/ Daroga) in Jharkhand. The JSSC SI Online examination will be held form 25th August to 10th September 2017. All those candidates applied for JSSC SI exam can download their call letter at the link given below. The Jharkhand Staff Selection Commission hold an online examination and Psychical Test for Recruitment of Sub-Inspector in Jharkhand. All those candidates who had appeared for Jharkhand Police Daroga for Sub Inspector (SI) Recruitment through JSSC, they are now required to check their JSSC SI result available at Jhakhand SSC’s official website at jssc.nic.in. After checking Jharkhand Daroga Result Candidates are required to know their status. How to Check JSSC SI Result: Before checking online exam result candidates have valid Roll No. 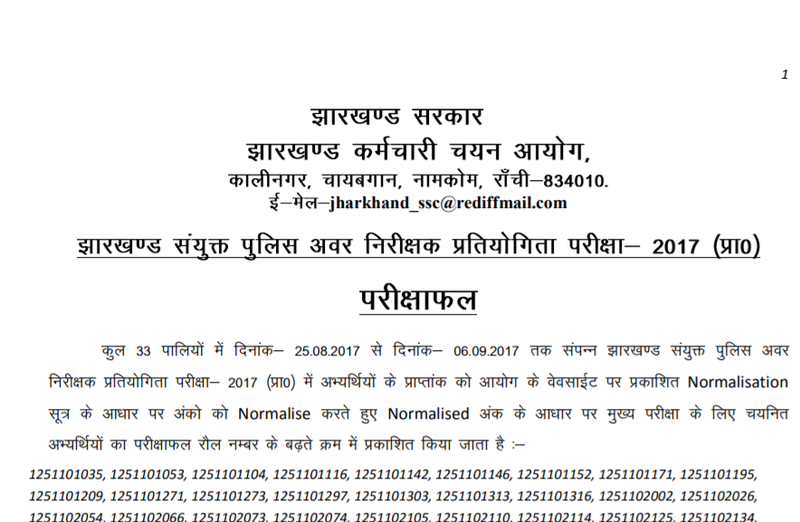 Find the link of Result For Result Of Jharkhand Combined Police Sub Inspector Competitive Exam-2017(PT). Search for your Roll No. Click on submit button to check Reslt. Candidates are strongly advised to check JSSC Daroga result as soon as possible for Sub Inspector (SI) Posts, other details exam date, exam time, reporting time are given in Call letter. JSSC SI (Jharkhand Daroga) Result [Download].